The Italian Lakes are such a hotspot for the elite with many Hollywood stars opting to spend precious downtime in this area of Northern Italy. Exclusive and desirable, none more so than the little known Lago d'Orta which is also the smallest. Lake Orta enjoys beautiful scenery including it's own Island dating back to 4th Century, San Giulio. San Giulio is home to an order of Monks, however visitors are welcome to peacefully enjoy the architecture which is dominated by the stunning Basilica of the same name. The lake is fresh and clean, quite unlike swimming in the sea and in the summer months it is refreshingly cool. Around the edge of the lake are various places of interest including the town of Orta with it's narrow cobbled streets and numerous galleries, it is a great place to visit for lunch or pick up a water taxi to tour the lake. For lunch I'd recommend the family run hotel, "Hotel Ristorante Giardinetto" with it's exquisite menu and outside terrace area which looks right out across to San Giulio. Another well kept secret of the lake is "Villa Crespi" an imposing Moorish Villa with a two Michelin Starred restaurant run by Italian celebrity chef, Antonino Cannavacciuolo, needless to say, booking is essential. 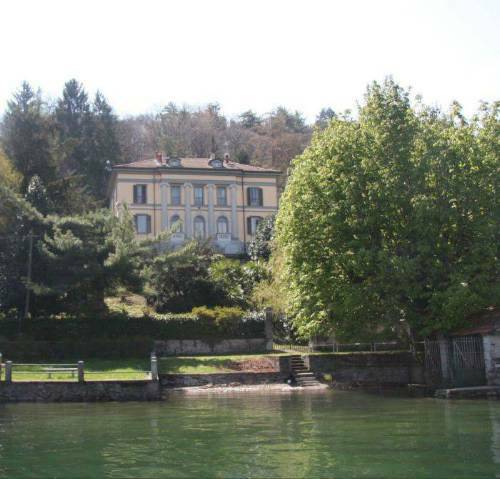 Some believe that Villa Castelnuovo is the finest house on the lake, it is certainly one of the most striking. The property comfortably sleeps fourteen, however the attic rooms are perhaps better suited to children or teenagers. The Villa has been restored by it's owners in a sympathetic and traditional fashion with fine furnishings and huge chandeliers. Accommodation is extensive, there is the added benefit of internet and Sky TV along with a games room and wine cellar. A full maid service is provided and a chef is available on request and by prior arrangement. Outside guests can enjoy the large garden which leads down to the boathouse and a private beach. Hire of Villa Castelnuovo includes the use of a 17ft Capelli open boat which does not require a licence, however additional fuel charges would need to be met. By boat is without a doubt the best and most enjoyable way to explore the lake which is almost completely still. In the boat house there are also canoes which are very popular with those interested in seeing the wildlife of Lake Orta. The Villa has two outside barbecues , one by the private beach and the other on the large entrainment terrace close to the house. The kitchen is fully equipped and always well stocked for guests' arrival. Villa Castelnuovo is available to hire throughout the year. It is around 45 minutes from Milan Malpensa airport and conveniently located to access the ski resort of Mottarone in the winter months. Prices start from £3685 per week in low season and are available on request via the "Owners Direct" website.